My Pāḷi reading group has been working through the commentary to the Kāraṇiya Metta Sutta which I translated for this blog some years ago (11 Jun 2010). In this text we come across an unusual term that has no counterpart in the suttas. In picturing some bhikkhus zealously meditating in the forest it describes them as yāmagaṇḍikaṃ koṭṭetvā. This is a curious expression and in this essay I'll attempt to elucidate what it means. The compound yāmagaṇḍika occurs only twice, both times in commentarial texts (Paramatthajotikā SnA 1.193; Papañcasūdaniyā, MNA 1.122) and these should be enough to allow us to gain some clarity. We'll see that the commentator does not see his own time in context, but wrongly assumes that his milieu reflects that of the Buddha some centuries earlier. The gerund koṭṭetvā must come from the verb koṭṭeti (from a rare root √kuṭ or kuṭṭ) 'to beat, crush, pound'. For example it is the action associated with a mortar (udukkhale koṭṭetvā DN ii.341) and with pounding grain (dhaññaṃ koṭṭenti Thī 117). It has other minor senses in PED, but these don't seem relevant here. The compound yāmagaṇḍika combines yāma and gaṇḍikā. We'll take these one at a time. According to PED gaṇḍikā derives from gaṇḍa 'a swelling; a stalk or shaft' + -ikā. The formation gaṇḍikā means 'a stalk or shaft', particularly 'the trunk of a tree' and by association 'a block of wood'. However there is a potential confusion here with ghaṇṭā 'bell' or ghaṭikā 'gong'. As we will see the CST edition of the text is quite unreliable and this means we must allow for errors. In the Digital Pāḷi Reader version of this text, we find yāmaghaṇḍikaṃ koṭṭetvā. The spelling -ghaṇḍikaṃ occurs in the Majjhima Ṭīkā (the sub-commentary on MNA 1.121) "yāmaghaṇṭikaṃ paharati" (MNṬ 1.196) though the Aṭṭhakāthā has -ga-. The Khuddaka Nikāya Commentary—which parallels the Suttanipata commentary—also has -gh-. DOP sv ghaṇṭī/ghaṇḍī, suggests a confusion with gaṇḍi and ghaṇṭā. If it does mean 'block' then it must refer to a resonant gong-like block that is 'pounded' (√koṭṭ) as a time signal. 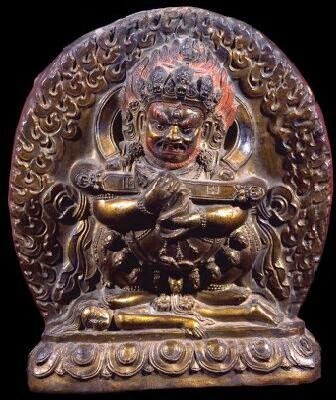 Buddhadatta's Concise Pali-English Dictionary defines gaṇḍikā as "(f.) a hollowed block of wood which is used to serve the purpose of a bell; a gong." A gaṇḍī or gaṇḍikā is the characteristic implement of a form of Mahākāla known as Pañjaranatha. In the image on the right he holds it across his body (thanks to Maitiu for pointing this out). Yāma is complicated because it has homonyms that derive from different verbs. From √yam 'hold, hold back' + -a we get yāma 'restraint'; and from √yā 'go' + -ma we get yāma 'motion, going, progress'. The latter is used figurative to mean 'a watch of the night'. We frequently read in Pāḷi of the three watches of the night (tiyāmā): paṭhamayāma, majjhimayāma, and pacchimayāma (first, middle, and last watches). The practice of dividing the night in particular in watches was common in the ancient world. The Latin name for these periods was vigilia, whence English 'vigil'. Incidentally yāma can also be a collective noun for people or things related to the God of the afterlife, Yama, in this case his name means 'twin', from √yam 'combine'. The compound, yāmagaṇḍika, can really only be a tatpuruṣa so it must mean something like 'the block of restraint', or 'the gong of the watches'. The context is that the monks are resolute night and day, devoted to wise attention, and sitting at the foot of trees meditating. 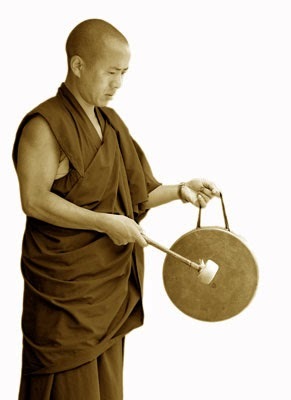 It may be that 'beating the block of restraint' is a metaphor that we no longer understand, similar to the Buddha saying to Upaka the Ājīvaka in the Ariyapariyesana Sutta, āhañchaṃ amatadundubhiṃ 'I beat the drum of the deathless' (MN i.171). It's not entirely obvious what this means since drums are primarily for entertainment in our society. Vajagara[giri]vihārepi kāḷadevathero antovasse yāmagaṇḍikaṃ paharati, āciṇṇametaṃ therassa. Na ca yāmayantanāḷikaṃ payojeti, aññe bhikkhū payojenti. Atha nikkhante paṭhame yāme there muggaraṃ gahetvā ṭhitamatte yeva ekaṃ dve vāre paharante yeva ca* yāmayantaṃ patati. The Elder Kāḷadeva of Vajagaragiri Monastery, performs this striking of the block of the watches till the end of the rains. And he does not use a measuring device as other monks did. At the end of the first watch the Elder takes up the hammer (muggara) and strikes twice for every measure of time, just as the watch-mechanism falls. * The text has vā, but I think this must also be wrong, and have amended to ca. My translation of this passage is a little rough, but the main points are clear. For our purposes two things are important. It is entirely clear that yāma must refer to 'a watch of the night' rather than 'restraint'. Secondly we read that Kāḷadeva did not yāmayantanāḷikaṃ payojeti, that he used a hammer (muggara) to strike the block, and then yāmayantaṃ patati. And this helps to fill out what the author of the Metta Sutta commentary was thinking. One of the problems of living a regular life is keeping time. The early forest monks had no way of telling the time apart from the sun, moon and stars. Pāḷi distinguishes day (diva) from night (ratti) and we read of monks doing things in the morning-time (pubbaṇhasamaya) or evening-time (sāyaṇhasamaya). We know that the phases of the moon—full moon (puṇṇacanda) and new moon (navacanda)—were important for organising the lives of monks. The moon takes on a magical significance for some Buddhists as a result of this. The watches of the night, however, are far more difficult to determine. How did monks, living in a forest, know when the watches began and end. Presumably the first watch started at dusk and the last ended at dawn, but what marked the other boundaries? Presumably one versed in astronomy would be able to keep track of when certain stars were due to rise and set, but the three month retreat is during the rain season when the skies are perpetually cloudy. The simple answer is that the first monks almost certainly did not keep accurate track of the time and that the watches were assessed subjectively. And we can point out that no references to time keeping apart from observing the sun and moon are referenced in the suttas. The texts we are dealing with here, however, are from 5th century Sri Lanka and from an environment of highly organised, large scale, urban monasteries. If we now look at the phrase yāmayantanāḷikaṃ payojeti we can see that the DOPN glosses it is as "the help of an hour-glass". Now an hour-glass is anachronistic here, they did not exist in this time or place. But yanta does mean 'mechanism' and nāḷika 'a tube or measure'. So we know that Kāḷideva did not, as other monks did, employ (pa√yuj) a measure/tube device for the watches (yāma-yanta-nāḷika). This suggests some kind of clock, but is the idea plausible? I had a dig around in some horological books and apparently it is plausible to think that in first millennium India there were water-clocks. Water-clocks come in two forms: a vessel with a hole that allows water to leak out slowly, and the slight more sophisticated sinking bowl, in which a bowl with a hole in it gradually sinks into a container of water. The books suggest that the sinking-bowl water-clock was common in India by medieval times and so accurate that it probably delayed the introduction of mechanical clocks. Importantly the attendant of water-clock announced the end of the time period by striking a 'gong'. The Gujarati word for which was ghaḍiyār. There's an outside possibility that this word is related to gaṇḍikā or ghaṭika. We do know that the Achaemenid Persians possessed just such water clocks, from the records of Alexander's conquests in India by Callisthenes of Olynthus. We know that similar water-clocks were employed to mark the passage of time in monasteries in North India by the 7th century. This information comes from the records of Yijing (義淨 aka I-Tsing; ) a Chinese monk who lived 635–713 CE, and spend 25 years travelling, taking the southern sea route to India. Yijing's account (see translation by Takakusu 1896: 142-6) is widely recycled in a variety of other sources, for example Misra (1998) simply quotes Takakusu at length, while Sharfe (2002) paraphrases and the Wikipedia article on water-clocks cites Sharfe. Yijing records the use of sinking bowl water clocks in several monasteries, with each using slightly different measures and signalling conventions. 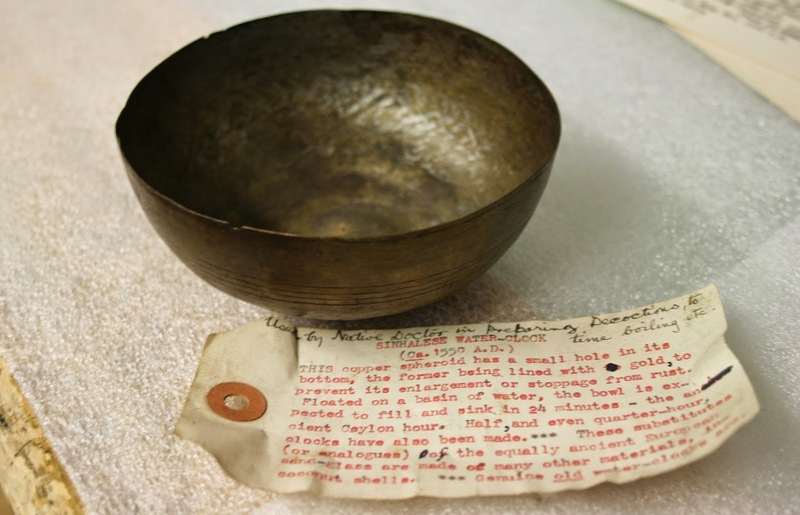 The bowls were made of copper and were very expensive, generally being the gift of a king to a monastery. Such clocks were also used by the ancient Britons. So it seems at least plausible that urban monks in fifth century Sri Lanka measured the hours of the day using a water-clock and marked the increments by striking some kind of gong (probably wooden given how expensive metal was). And what our commentators have done is imagine that this is also what monks did in the Buddha's time. Thus when they tell the story of the Metta Sutta they project this technology backwards. And we know that they have done in this other ways as well. For example they projected South Indian kinship patterns familiar, to them in Sri Lanka, onto the family tree of the Buddha and his family, even though these patterns were out of place in North India (See Attwood 2012). But it is extremely unlikely that forest monks in the fifth century BC uses anything so elaborate to measure time. One little loose end is that having struck the gong with the hammer, yeva ca yāmayantaṃ patati. Now, patati comes from √pat 'fall, fly' and it's not usually a transitive verb. Yanta being a neuter noun we can read this as 'and just as the watch-mechanism falls'. If the yāmayanta falls at the end of the time period, then this is consistent with a sinking bowl style water clock. It is fascinating how a short phrase like this one can open a window into history. And while here we are not talking about the time of the Buddha, but of the period of the Sri Lankan commentators, it is still a glimpse of history. It reinforces the point that the commentaries reflect their own time rather than any earlier time. They are apt to project their own culture and technology backwards onto the past, making them unreliable guides to the past. Thus when we consult the Pāḷi commentaries for insights into the suttas we must be cautious in drawing historical conclusions. The commentators were no doubt sincere, but they had a vested interest in trying to establish that the past was reflected in the present because it was one way of establishing their legitimacy as bearers of the tradition. It shows how very tenuous lineage is as a guide to legitimacy or authenticity. Attwood, Jayarava. (2012) 'Possible Iranian Origins for Sākyas and Aspects of Buddhism.' Journal of the Oxford Centre for Buddhist Studies, 3. Misra B.N. (1998) Nālandā: Vol. 1. Sources and Background. B.R. Publishing Corporation. Sharfe, Harmut. (2002) Education in Ancient India. Brill 2002. Takakusu, J. trans. (1896) I-Tsing, A Record of the Buddhist Religion : As Practised in India and the Malay Archipelago (A.D. 671-695), Clarendon Press 1896. Reprint. New Delhi, AES, 2005. What can the Turing Test Tell Us?